In most countries, their local cuisines always go with the wine/drinks which produces locally. Take a look at Argentinian steak and Malbec, Barolo with their rabbit while Japanese sushi goes well with sake. You might be surprised how delicious wine and sushi can be together. But amongst sushi lovers or even some wine lovers, the bigger question is, which bottles should we open? For chablis that goods almost perfectly with most Japanese fish, I like Raveneau, Dauvissat, and William Fevre; With tuna, pork or beef, a great pinot noir would be unbeatable. Recently I went to a very tasty and hearty japanese restaurant, Sushi Love沁の料理, situated in the heart of HK island in Causeway Bay . Wonderful night with great food and wine friends. This time, all we drink was wine. 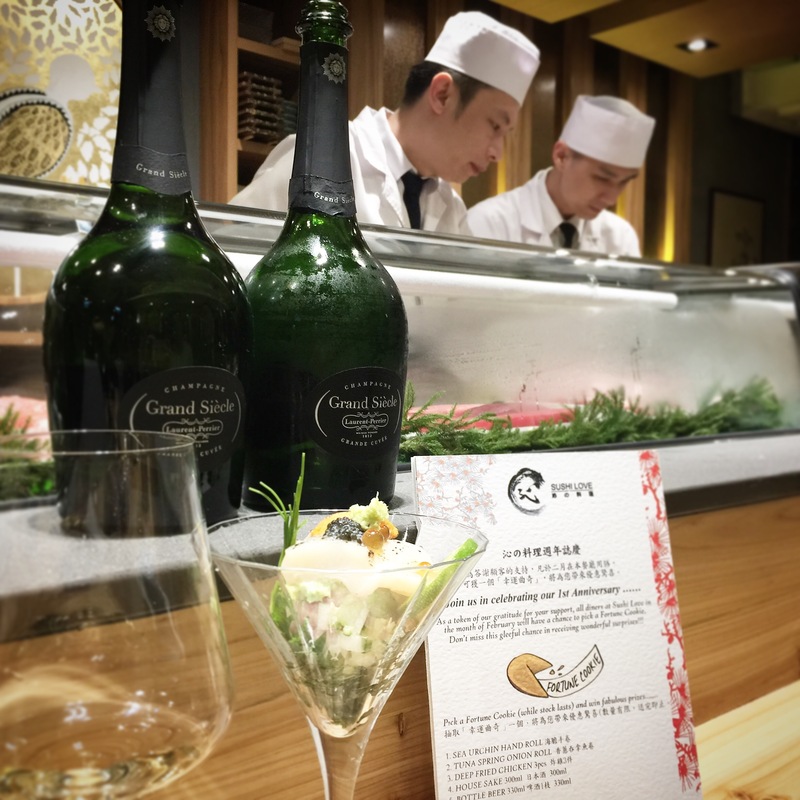 The lush and rounded Laurent-Perrier Grand Siecle Champagne (HKD850) with the really tasting “amuse bouche” uni and scallop appetizer. Grand Siècle is Laurent-Perrier’s prestige cuvee made with a pinot noir and chardonnay blend, which has always been non vintage, a blending of top wines from top years. Twelve of the most prestigious villages supply these grapes; all of them classified at 100% Grands Crus such as Ambonnay, Verzenay, Mailly, Avize, Cramant, Chouilly and Le Mesnil-sur-Oger. Within the vineyards of these villages, only the very best plots are selected, as are the finest musts from the pressings. The wine is aged on the yeast in bottle for approximately five years. It is a truly amazing NV, one of the best NV Champagne I found. It is elegant, balanced with great fruit with aged flavors of honey, hazelnuts, grilled almonds and brioche, make this the perfect companion for refined dishes. Then we opened a bottle of Kosta Brown “One Sixteen” Chardonnay 2013 (HKD500) from the coolest part of the Russian River Valley in USA, paired with some raw sashimi (as shown in picture). The wine is round, rich with great intensity and minerality; tropical fruits like apricot green apple and honey, style is slightly oaky in a good way. I find the alcohol of this wine slightly higher and the wine opens up nicer after time. The pairing was surprisingly great especially with the raw shrimps together with roes really freshen and sweetened up with the wine. Then we moved on to one of the chardonnay I love outside of burgundy. The Australian Leeuwin Estates Art Series 2013 (HKD550). This Chardonnay is wonderful by itself or with food. It is lemon fresh, elegant and finely balanced with white flowers, almond, great complexity and length. The great acidity of the Chardonnay cuts the fat of our paired pork asparagus roll and the tempura, making everything light weighted. Finally there comes something non-chardonnay. It was a pinot noir from one of the best land. 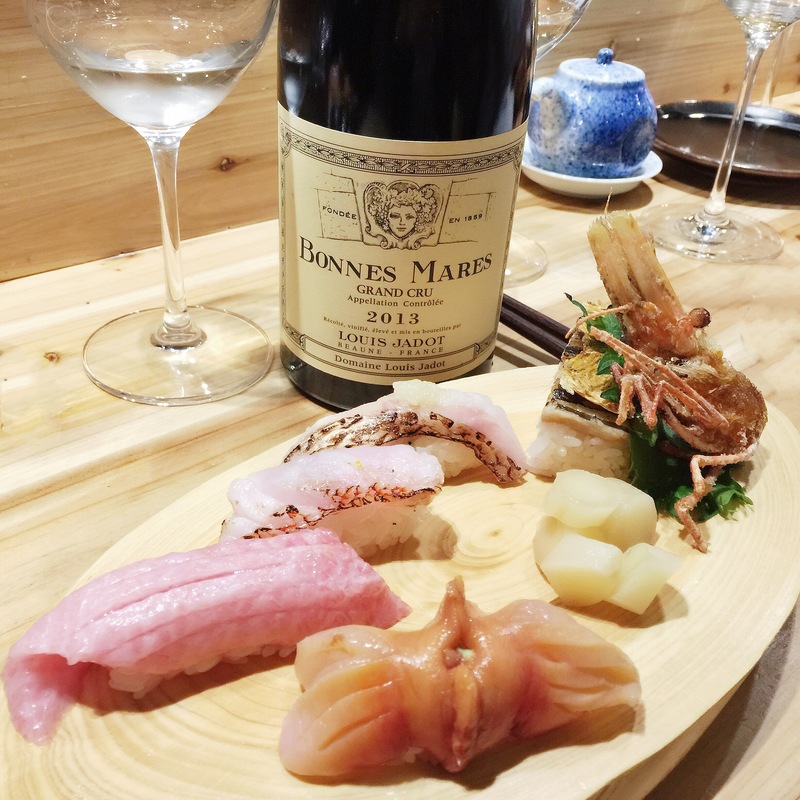 The broad and generous Burgundy Louis Jadot Bonnes Mares 2013 (HKD2200) pairs so well with few pieces of sushi (highlight the toro and the fried shrimp head!) on the board. A refine bouquet of dark berries and earth. Powerful(yet not too powerful for food we are having) well balance with such great long finish. Beauty always takes time but even opening it up today, it taste so fresh and enjoyable. Next time, when sushi meets you, perhaps have them with wine (and sake! ), why not!